"Ultimately, Nightshift should appeal to composers in need of slickly polished grooves and licks for their own chilled productions. 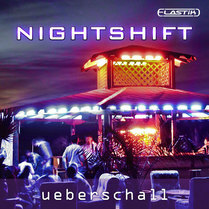 4/5 Stars"
Described as ‘Natural Chillout Music’, Ueberschall’s Nightshift features 18 song-construction kits aimed at smooth, laid?back grooves that typically fall into the unhurried range of 59 to 91 bpm. nstallation for me was a little fiddly, the response?based system being complicated by the insistence that I on replaced the Elastik player right away. However, after downloading Elastik 2 and authorising the two chill?out libraries that are Nightshift, I was ready to rock. Or rather, mooch. The collection arrives on a DVD containing 2.9GB of glossy drum loops, percussion, acoustic and electric guitars, vocals, basses, keyboards and tasteful sound effects. As with all construction kits, there’s a strong risk of creative angst — the feeling you’re simply remixing someone else’s song — but take a percussion loop here, a guitar part there and let Jiminy Cricket nag you later. With 950 loops and samples on tap, it’s fortunate that the built?in browser is very intuitive, its drag-and-drop technique applicable to individual samples or complete folders. Typically, full mixes appear on the target note of such drag operations, with individual elements mapped over the adjacent notes. You can drag several folders to the keyboard if you like, and thus combine loops intended for different sections of each song, or mix and match loops from a selection of songs. The keyboard’s six octaves offer plenty of scope for instant remixes; you can easily copy samples from one key to another, in order, for example, to create variations or to slice them chromatically to be spread across the keyboard. And, for speedily cooking up alternate mixes, a press of the Random button will randomly assign a new loop of the same type to the current key. The 18 song kits have titles like Deep in Dub, Chillness, Relaxation and Sunset, so you have a good idea what to expect. Each song is supplied with intros, main sections and outros, and some have extra variations to broaden the scope slightly. For example, there are some fine guitar performances that any keyboard?based composer would be grateful to borrow. Although all the elements fit together beautifully already, the Elastik 2 player has the power to make transformational changes via its circular ‘loopeye’ window. There, loops play not from left to right in a conventional view but run clockwise around the centre. The loopeye is divided into slices, the resolution of each varying for elements arranged around the circumference. Thus, every slice contains an independent modulation depth for pitch, formant, resampling, volume, pan, cutoff, resonance and reverse. You can also set overall values, such as cutoff and resonance, for each loop, but the flexibility offered by this individual slice method really does take the cake. Elastik 2 offers more tricks than we have room to explore, but it’s comforting to know that when you tire of those gentle and relaxing grooves, you can extract a little more from them courtesy of these highly effective tools. Also, since all parameters are MIDI controllable, that adds another snappy way to make real-time changes within your song.